We had an excellent dinner at Blanca Blue Restaurant & Lounge located at the Garza Blanca Preserve Resort & Spa, in the Zona Sur (South Zone) of Puerto Vallarta, Jalisco, Mexico where we dined outside and had views of the attractive glass sculptures lining the walls and sunset views over the Pacific Ocean to complement Chef Fernando Pulido's and Sous Chef Refugio Silva's inspired cuisine. 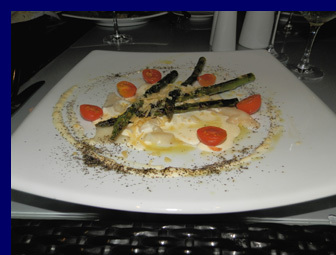 Visiting Puerto Vallarta in late April 2014, we found that it is definitely a city for foodies offering very high-quality sophisticated restaurants to match diverse personal preferences and palates. 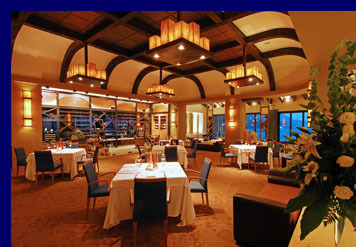 One of the restaurants "we discovered" on our trip was the Blanca Blue Restaurant & Lounge located at the Garza Blanca Preserve Resort & Spa. Blanca Blue Restaurant & Lounge has an interesting cocktail menu, and as (Edward) loves all things chocolate, he had to try the Mexican Manhattan made with tequila, vermouth, bitter chocolate, mole, and garnished with an orange slice and a cherry, while (Debra) had a glass of champagne to pair with the beautiful evening. As one of our appetizers (entradas) we selected the Beet Carpaccio, which was slow roasted beets paired with fresh goat cheese and vanilla and grapefruit vinaigrette, (Carpaccio de betabel, betabel asado lentamente con queso de cabra fresco y vinagreta de vainilla y toronja). 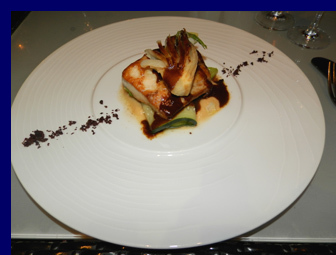 This colorful course presented an interesting mélange of flavors and textures to tempt the palate. For our other appetizer, we had the Asparagus Ravioli, which was tender pasta filled with ricotta cheese, parmesan, and asparagus, in a rich butter, fresh lemon, and diced San Danielle prosciutto sauce, and was garnished with asparagus spears and cherry tomato halves (Ravioli de espárrago, rellenos de queso ricotta, parmesano, espárragos, con salsa de mantequilla limón real y prosciutto San Danielle). 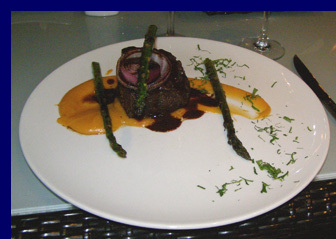 Gorgeously presented, exquisite taste followed on the palate. We continued with a main course (Plato Fuerte) from the Ocean (Océano) section of the menu, with the Roasted Mahi-Mahi artistically presented with a kalamata and sesame scented veal juice, hummus, blanched zucchini, with cumin bread and Meyer lemon zest (Dorado Glaseado, sobre hummus, calabazas escaldadas, emulsión de ajonjolí y aceitunas negras y migas de pan de comino), which was another well-executed course. From the Earth (Tierra) section of the menu, we selected the Boneless Short Rib, which was very tender braised short rib glazed au jus, presented with ginger scented sweet potato puree, grilled onions and asparagus (Costilla cargada braseada, glaseada en su jugo, puré de camote perfumado con miel de arce, espárragos y cebolla al grill). We paired both of our main courses with a bottle of Crin Roja Tempranillo, 2012, from Spain, 13% alcohol, made from 100% tempranillo grapes, fermented in stainless steel, and then rested in French and American oak casks for 1 month. The wine was heady and aromatic and able to complement both the fish and the short ribs with its dark fruit, medium tannins, and chocolate notes on the palate. Dessert (Postre) was ultra decadent in the form of Chocolate Oaxaca, which was a moist chocolate cake paired with a quenelle of spicy sweet potato ice cream, with chili and port coulis, and walnut crumbs (Chocolate Oaxaca, pastel de húmedo de chocolate, quenelle helada de camote especiado, coulis de chiles y oporto con migas de nuez). A wonderful dinner, a pretty setting, and a beautiful sunset; what more could one ask for? Blanca Blue serves Breakfast, Lunch, and Dinner. 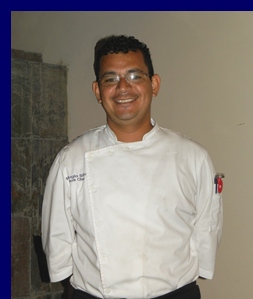 Read the interview with the Chef and sample his tasty recipes to tempt your palate into making a trio to Puerto Vallarta in the Chefs' Recipes section. 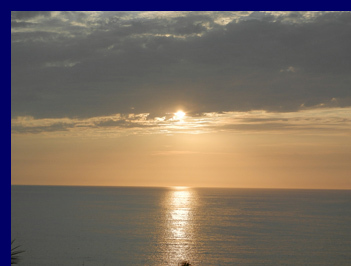 Please read other articles on Puerto Vallarta, Mexico in the Hotels and Resorts, Restaurants, Spas, Chefs' Recipes, Adventures, and Gastronomy sections. © May 2014. Luxury Experience. www.LuxuryExperience.com All rights reserved.